Above you will see several FAQs categories. Each of these categories opens to a new page. We tried to keep them categorized so they may be easier to search. We will continue to try to improve this FAQs section of the site. We invite everyone to look around and leave comments or questions about The Mighty Duke Power Pull. You can also use the Contact Us form to get personalized responses. We are working to build a more complete FAQs section as we go. Hopefully, many of the questions posted here will be used in building our FAQs pages. Wagner-Martin Development LLC, (State of Washington company) the company that produces The Mighty Duke Power Pull, an automotive collision repair system is moving forward with aggressive plans for the future. 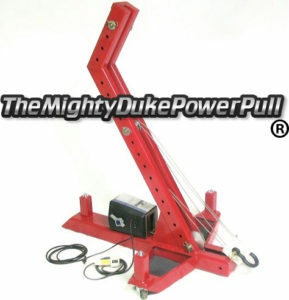 The Mighty Duke Power Pull, also known as a “pulling machine” in the auto repair industry is a tool used in body shops to straighten cars that have been damaged.